New workflow and barcoding solution helps digital content studio increase turnover by 600%. I Heart Studios is a rapidly expanding digital content studio based in London, with a strong ambition to become the biggest photography studio in the UK. Since 2008, I Heart Studios has been working with top retailers to supply high-quality creative visual content. Following continued expansion, I Heart Studios was looking for a better way to manage its business operations. Its existing processes were heavily reliant on manual effort and had little technology support, leaving teams to manually process thousands of items of clothing and accessories each day from multiple clients. I Heart’s manual processes were reaching their limit and becoming a barrier to scale. As each box of clothing and accessories arrived for shooting every item had to be laboriously recorded in a Google spreadsheet and then manually allocated to clothing rails for shooting. But the absence of a connected system made things complicated, with a lack of visibility and control often leading to errors with rails, extra re-shoots and higher costs. Furthermore using spreadsheets to record information about items didn’t give clients any visibility into the status of their items within the end to end photoshoot process, causing additional reporting work and leading to frustrated customers. 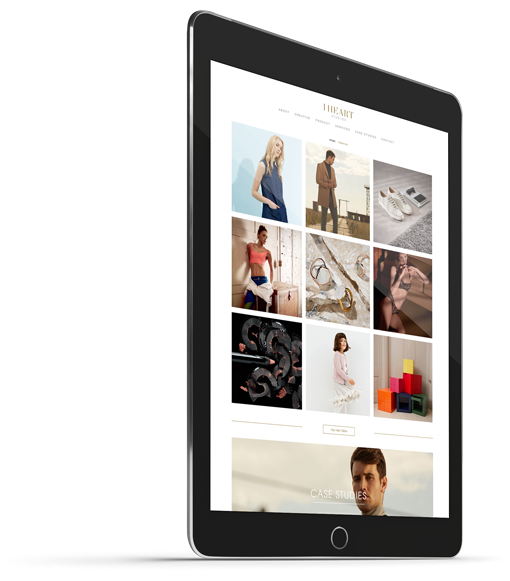 I Heart therefore decided that they needed a joined-up way to manage their entire business workflow – from the arrival of clothes and accessories through to their photography, retouching and return to customers. All of the solutions that I Heart Studios had considered lacked the level of customization required for their specific processes or required too high an investment to succeed – leaving them uncertain about the best way to digitize their operations and achieve the higher scalability, control and efficiency required to meet their growth ambitions. Together with an integration partner, I Heart delivered a RunMyProcess application that digitized and automated its end-to-end processes, fully integrating Salesforce to ensure joined up operations from initial enquiry to final invoice. notifying the goods-in team that a consignment will arrive. Once received, the goods-in team uses the application to scan barcodes, record the items and add the data to Salesforce. Previously photographed items are flagged to avoid duplication and save costs for the client. Finally, any missing or unexpected items are automatically recorded against the customer order. The application next enables a customer service manager to approve the job and allocate a rail of items to a photographer. The assigned photographer uses the application to scan each barcode as they shoot, linking the photo and confirming that every item has been photographed. Once validated the application makes the photograph available within a ‘retouching queue’ for finishing by a graphic editor. Finally the application uploads the edited photograph to a web portal for the client to preview and approve. Once all photographs have been shot and edited, the application enables the client services manager to submit the file and finalize the client’s invoice, which is generated automatically in Salesforce. The invoice and a summary of the shoot are emailed to the client, with a link to the web portal containing the photos from the shoot. Finally the application creates a repacking task for the goods-in team, ensuring that items are scanned, replaced in the correct box and dispatched back to clients. said Sjors Bos, general manager of I Heart Studios. I Heart can now process a larger amount of orders and has grown by more than 600% in 12 months. In response to rising demand, I Heart also increased their workforce, growing from 12 to 102 employees in the space of just six months – all without additional investment or major disruption. “The simplicity of the technology makes it easy for new users to adopt without substantial training cycles,” explained Sjors Bos. Since the initial successes, RunMyProcess has continued to work with I Heart to grow and extend their application, helping them to maintain their pace of innovation and satisfy the continually changing needs of their rapidly expanding business.